Many experimental therapies for autoimmune diseases, such as multiple sclerosis (MS), aim to bias T cells toward tolerogenic phenotypes without broad suppression. However, the link between local signal integration in lymph nodes (LNs) and the specificity of systemic tolerance is not well understood. We used intra-LN injection of polymer particles to study tolerance as a function of signals in the LN microenvironment. In a mouse MS model, intra-LN introduction of encapsulated myelin self-antigen and a regulatory signal (rapamycin) permanently reversed paralysis after one treatment during peak disease. Therapeutic effects were myelin specific, required antigen encapsulation, and were less potent without rapamycin. This efficacy was accompanied by local LN reorganization, reduced inflammation, systemic expansion of regulatory T cells, and reduced T cell infiltration to the CNS. 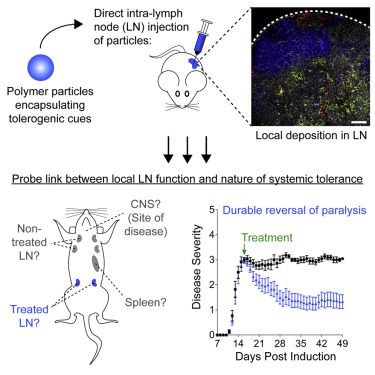 Our findings suggest that local control over signaling in distinct LNs can promote cell types and functions that drive tolerance that is systemic but antigen specific.